The day he disappeared, Richard was cold, wet, and determined to move on with his seventeen-year-old life. Letting himself quietly out the farmhouse door, he looked towards the grey clouds and turned up his collar against the wind. Standing there, the gentle drizzle forming droplets on his nose and trickling down his cheeks, he felt a momentary pang of guilt. His dear old aunt would be upset at his unannounced departure and the note, too quickly scribbled and left on his bedside table, was short and inadequate. He should have said goodbye in person, that was the right and proper farewell. But he couldn’t face her to say the words. Couldn’t bear the look of disappointment on her face. Couldn’t trust himself and his own emotions, either. Instead, he swallowed hard and, ignoring the chill that seeped into his bones through the well-worn duffel coat, he hoisted his bag over his shoulder and started with loping strides north-east towards the sun, on the long road that led to the horizon. He walked for what seemed like hours. From time to time he blinked the rain from his eyes and stuck out his tongue to catch the drops. The roof of his mouth felt rugged and stale, still flavoured with the taste of his hastily eaten breakfast; baked beans. In the distance, puffs of smoke curled slowly into the sky and he imagined a small homely cottage nestled into a curve in the landscape, over the next hill. A combustion stove, just like the one his aunt kept lit, was probably the source of the smoke. Suddenly hungry, he thought of bacon and eggs sizzling in the pan, and delicious cakes and pies that were his aunt’s favourite treats. The farm had been a safe haven, of sorts, after his parents’ deaths seven years earlier in a car accident. Aunt Nance was a kind-hearted woman, generous with her affection and home-cooked meals, and Richard couldn’t deny he had been loved and cared for by the old woman. Yet he had always had a feeling of not quite belonging, that it wasn’t really his home. There had been tension and arguments with his cousin Bill, who had retaliated in spiteful ways when his position of only child had been threatened. Sly pokes and punches when no one else was looking. Snide remarks. But he had taken it all in his stride and pushed away the cruel words. And stayed out of Bill’s way whenever he could, keeping his own counsel. His aunt would have been mortified, had she known. Again he felt a wash of guilt. What had he thought? Leaving and not saying goodbye after all she had done for him? The road ahead divided a multitude of green and brown paddocks as far as the eye could see. In them, scattered groups of cattle and sheep continued grazing, disinterested in the lone hiker passing by. Trees stood in random clumps about the slopes, occasionally converging at a dam like schoolboys around a fight. Richard’s bag was heavy on his shoulder. The previous day he’d gone into town and withdrawn his meagre savings, spending it in the local Army Disposal Store on items he hoped would see him through his journey. How useless were most of the things he’d learned at school now. Nouns and adjectives wouldn’t keep hunger from his door. And logarithms and equations couldn’t help him light a fire. He smiled involuntarily as he thought of his Uncle George, who had patiently taught him that art. How he had loved the robust grey-haired man. Nineteen fifty-six – the year Uncle George had died – had been one of the saddest years of Richard’s short life. His uncle’s death, coming so close to that of his parents’, had hit him hard. His Uncle had taken him camping and fishing, whenever he could spare time from the farm. Together they had slept out under the Southern Cross on balmy nights, practising survival techniques which he could now put into practice. Bill had rarely joined them on those trips, and Richard had relished the time alone with the old man, temporarily free from the constant arguments with his cousin. But, he thought now, those arguments were behind him, left back at the place he had departed from this morning. Today, one year later, with the knowledge his uncle had given him, he was ready to take on the world. And the knowledge that all his worldly possessions were stored in the bag he had slung over his shoulder gave him an exhilarating sense of freedom. The incline ahead became steeper and Richard strained against the wind. The clouds before him had slunk low, concealing the crest of the next hill. The road disappeared into the mass of it. Puzzled, he blinked, staring ahead. Faint flickering lights came from within. Had there been an accident? Perhaps two trucks had collided in the poor light? Worried, he hurried towards the crest. Suddenly he was surrounded by the cloud. It was grey and swirling, and immediately he was disorientated. The ground seemed to buckle up below him and he felt unsteady, confused. Where was the road? He stretched his hands before him, feeling his way. Shapes moved around him – formless featureless figures. He heard voices, indistinct muffled sounds. Could no one see him? He began to shout, but the cloud swallowed the sound and it echoed back at him, dull and flat. Hands grabbed at him, pulling him forwards. The bag fell from his shoulder and he reached back for it, but the hands pulled him on. Sometime during the afternoon, the grey cloud rose rapidly upwards, revealing the road and the crest of the hill. Two cows in the nearby paddock blinked large dull eyes at the gentle rain that shrouded the bleak countryside. The wind whistled mournfully through the treetops. Ahead, the road lay empty, except for a bag lying on the verge, open, its contents spilled in random disarray on the damp grass. No one on Earth knew that Richard had gone. Congratulations on the impending release of your book! Love the cover and it sounds like a fascinating story. Well done and I hope your sales go through the roof! 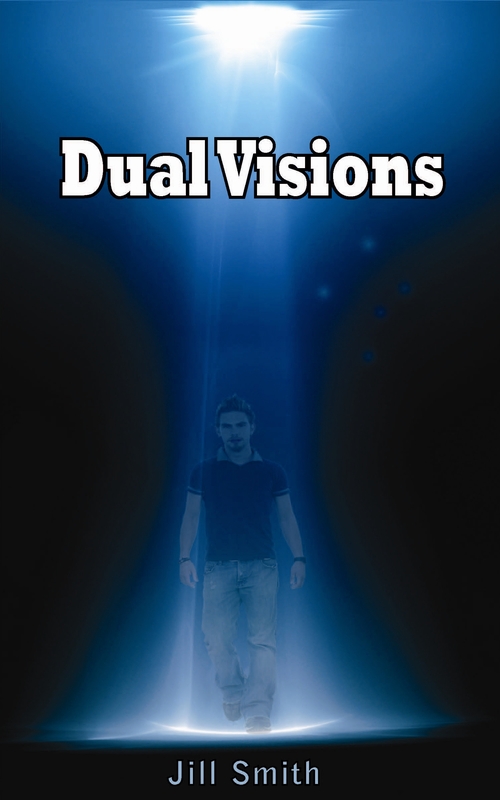 Thanks for commenting on my blog and the release of Dual Visions, I now have it’s follow up Vashla’s World both available through Amazon as books 1 and 2 of The Ancient Alien Series.